Your personal journal to track your goals, workouts, and intentions throughout your wellness journey. Feeling like you’ve tried everything to stay on track of your health goals but nothing seems to stick? Suffering from information overload from guides, Internet or your peers leaving you without the ability to move forward or make a decision? If you want to have a better handle on setting goals, weight loss, mental health or simply improving your overall health, this is a great intro to take that first step. I want to help you to reach your potential and to offer a resource that will provide that extra boost and accountability. I created this journal for YOU. So you can see and reach your true potential in a fun and stress-free way. This journal is your guide through the entire process. 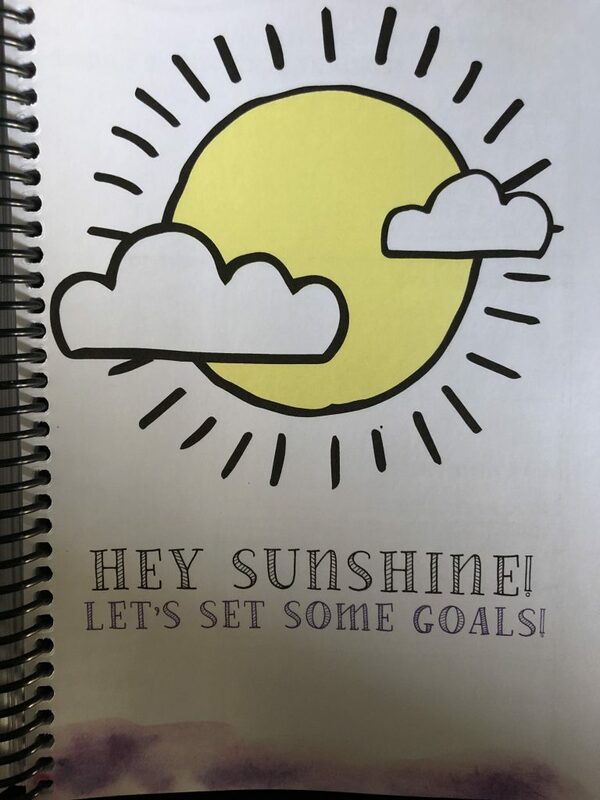 You’ll find 90+ pages of prompts with weekly trackers and two-page logs to write your goals, intentions, track your food, thoughts and progress — all to help you move towards a healthy lifestyle that will stick. Not sure where to begin? Let’s chat. Set up a one-on-one goal setting call where we’ll identify your top three goals and actionable steps to help complete each one of these goals. So, how did I get here? The answer starts with where I came from. I went to school and earned my degree in physical education and dance education. As a teacher, I realized I didn’t want to teach kids who didn’t “want” to be in my class. One day, my mom mailed me a newspaper clipping for an open house at NPTI. Teaching other people to help themselves get health was exactly what I wanted to do. I completed my certificates in personal training and 100 hours in nutrition within six months. After months of continuing to work crazy hours and trying to balance taking care of my son and housework, and my eating habits suffered. I wasn’t able to spend time with my son and . I was unable to always button my pants, and they were seven sizes bigger than my normal size. I decided my son and I deserved better, and so I changed. I applied for a training job, started working out six days a week, and overhauled my eating habits. In eleven weeks, I was filling my schedule with clients and down thirty three pounds. Over the next year, I lost another seven pounds, to an even forty pound loss. Since then, I haven’t stopped learning about nutrition, training, and even self improvement. I have changed my personal eating habits and training routines several times over. I have moved, gotten married, and had two more children.I know what it takes to successfully live a happier, healthier life. I also understand there is the physical health, the mental health, and the nutritional aspects to being healthy. I’m excited for you to join me on this journey.